Free Shipping Included! J.K. Adams 12 Bottle Wine Storage Rack, Driftwood by J.K. Adams at Verve Wine Bar. MPN: MWR-B12-DRFT. Hurry! Limited time offer. Offer valid only while supplies last. Our modular racks have become classics for amateur and serious at-home wine collectors. Made from North American hardwood with a Driftwood finish. Our modular racks have become classics for amateur and serious at-home wine collectors. Made from North American hardwood with a Driftwood finish. 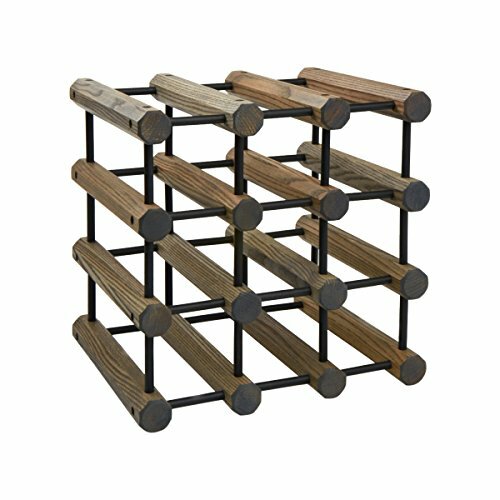 The J.K. Adams Wine Storage Rack, 12 Bottle, Driftwood allow complete flexibility in assembly. Each rack is infinitely expandable and comes with extra joining pins to allow for additional racking as needed. Build a J. K. Adams rack up or out. Let it grow with your wine collection. At J.K. Adams, we believe that the kitchen is the heart of the home. It is this belief that drives us to create the highest quality, hand-crafted products for cooking and entertaining. It is our job to give you the tools to make cooking and entertaining easy and fun. We love to hear about the well-used carving board that serves one family's Thanksgiving turkey year after year or the cutting board used to prep a great dinner for friends. It is these stories from our customers that keep us going. In 2014, we celebrate the 70th anniversary of J.K. Adams. In this time, plenty has changed. We are proud to say that our values have not. We remain committed to producing high-quality kitchen and housewares products by hand from North American hardwoods in Dorset, Vermont. We are a second-generation family-owned business with employees that have been with us for years and who are proud of the products we produce together.